Despite the many differences that exist between individuals, we should all live in harmony in the global village; however, war and conflict currently threaten the lives and safety of all. In order to end war and inherit everlasting peace in the future, we must teach the values necessary for a new era of peace rather than the old ideology that has been stained by war. HWPL Peace Education’s vision is to enlighten students and cultivate talented individuals with the values and spirit of peace, who can then play a pioneering role in spreading the culture of peace. This education provides a fundamental understanding of the basic principles that human beings must observe for peace to be created. Through the discovery and internalization of these peace values the inner selves of students and their ability to live together in harmony with others in their own community, and even the world, is properly nurtured. 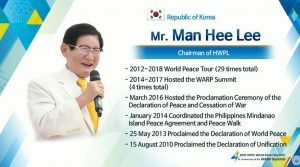 In order to successfully cultivate children and young people as peacemakers, HWPL Peace Education first works to erase previously held ideas and values that are corrupt by directly showing how the world has become evil in the present era, and then plant the peaceful values needed for the new era of peace in their stead. It also introduces a new methodology in which the values of peace can be applied in all environments and real-life situations happening outside the classroom. Having dedicated 17 years to teaching, Mr. Mathias Kevin Osimbo, the In-country Representative of Teachers Without Borders in Kenya, said “It’s disheartening to teach people and then they perish. As a person, you might feel like you should give up. 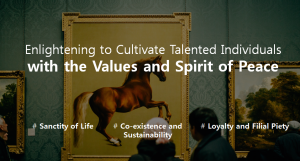 But in the contrary, that has even encouraged me more to work so hard and incorporate the concept of values.